Windows Vista gives you a great deal of flexibility when it comes to creating keyboard shortcuts (also called hot keys). You can use hot keys to open programs, files, and even Web pages. Creating a hot key to get you where you want to go in Windows Vista can be major timesaver for people who always work with the same documents and folders. In order for Vista to handle hot key commands, it must watch as you use the keyboard. When you press Ctrl+Alt+C, Windows recognizes that as a possible hot key combination. It then looks in a handful of places for shortcuts with that combination. One of the places Windows looks is inside all the folders on the desktop. When Windows finds the correct shortcut, it runs the corresponding program, in this case Windows Calculator. Create and open a Hot Key Shortcuts folder on your desktop. Theoretically, shortcuts with hot keys can go anywhere on the desktop or inside any folder that sits on the desktop. Windows doesn’t require you to set up a special folder for hot key shortcuts, but it’s so much easier to keep track of your hot keys if you keep them all in one place. Navigate to the program, file, or folder you want to launch with a hot key (but don’t actually launch the program). 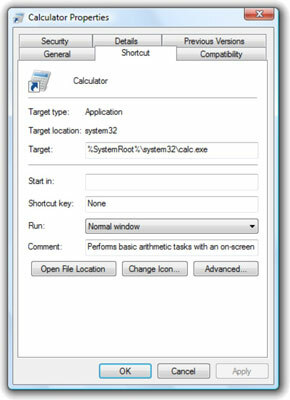 For example, if you want to create a hot key for the Windows Calculator, choose Start→All Programs→Accessories and find (but don’t actually open) Calculator. If you want a hot key for a file or folder, use Windows Explorer and navigate to where you see the folder or file in the window. To create a hot key for a Web page, navigate to the actual Web page you want to use. For a program, file, or folder, right-click it and choose Send To→Desktop (Create Shortcut). For a Web page, click the favicon symbol immediately to the left of the address bar in your browser. Then drag that little icon to your desktop. If you want the hot key to open several documents at the same time, first select all the documents you want to open, then right click to create the shortcut. When the shortcut is launched, all the selected files will open. Drag the newly created shortcut into your Hot Key Shortcuts folder. In the Hot Key Shortcuts folder, right-click the newly created shortcut and choose Properties. The Properties dialog box opens. In this case, the shortcut is for Windows Calculator. Click the Shortcut tab and then click in the Shortcut Key box. If you press the Backspace key at this point, the Shortcut Key reverts to None. This is also how you get rid of a hot key that’s already assigned. Press the key combination that you want to use as a hot key. By default, Windows uses Ctrl+Alt for most keyboard shortcuts. Simply type the letter that you want to associate with Ctrl+Alt, and Windows fills in the rest for you. Windows recognizes several odd combinations and a bunch of very common ones (including all the function keys), but to avoid confusion and conflict with the programs you commonly use, it’s best to keep it simple. After you click through zero, one, or two security messages, your hot key becomes, uh, hot. Press your new hot key combination. If you didn’t get the results you expected, your hot key combination is already being used. For example, if you already have Ctrl+Alt+P set up to launch Windows Paint, and you try to assign Ctrl+Alt+P to a different program, as soon as you press Ctrl+Alt+P, Paint starts running. There’s no way to use Ctrl+Alt+P a second time. If you find that your hot key is already being used, go back to Step 5 and choose a different combination. For some unknown reason, some combinations just don’t seem to work on some machines. For example, some PCs refuse to recognize Shift+F12. You may encounter similar problems.